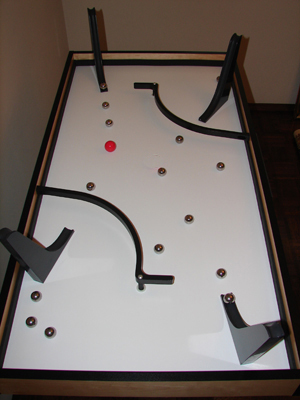 Classic real-world games, like billiards and foosball, use sticks and pegs to propel balls. Now there's a better way that's more fun. Use steerable chutes to propel and aim balls. Two, three, or four people play simultaneously. All players have an impact on the target ball at the same time. No waiting for your turn. There are two teams, one at each end of the table. 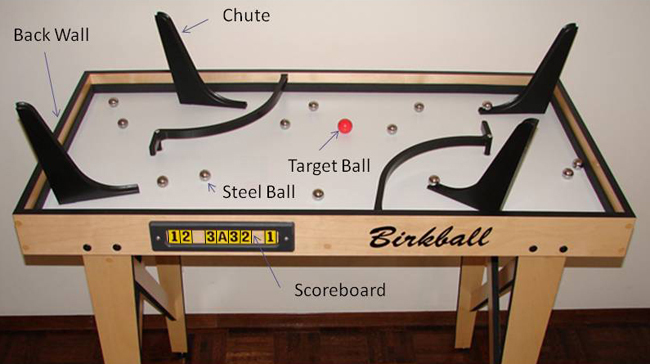 Play consists of rolling steel balls down steerable chutes across a field into a target ball to move the target to the other team's back wall. It's challenging to steer a chute and launch steel balls to hit a moving target in the desired direction. There is a constantly changing obstacle course provided by randomly rolling steel balls. The game is totally engaging because two hands are reallocated among three tasks: gathering steel balls, steering a chute, and releasing the steel balls. Players joke about the events of play. Production - Made in the U.S.A.